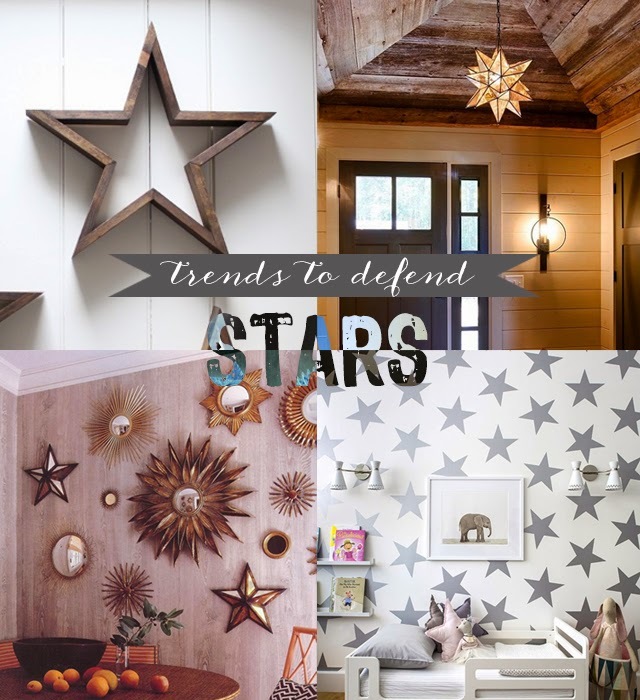 Everywhere I go I'm seeing stars - in lighting, decor, wallpaper, textiles. I happen to love the bold, graphic nature of a star print along with their ultimate versatility. You can find beautiful stars anywhere from the side of a rusty barn to modern wall paper, kids textiles or antique art. Hard to find fault with something so practical. What do you think? Sick of stars or starry eyed? Any other trends we should examine? I love the stars trend. We just added gold stars to our little girl's nursery ceiling after seeing Dina's (Honey & Fitz) amazing ceiling makeover. It was perfect for us renters. I will always be a fan of stars, they are so gorgeous! How funny...I was just at Shades of Light's outlet and saw some cute star pendents that I thought would be cute closet fixtures. They don't necessarily go with the style of our house (oh wait, the style is 70s disaster home, are you familiar? ), but they were so cool! I'm down with the light fixtures, for sure. Agree! We just did my sister's baby shower (gender unknown) with the star theme and I loved doing it! It was pretty easy to find star things while out shopping either at craft stores or discount stores which was great!